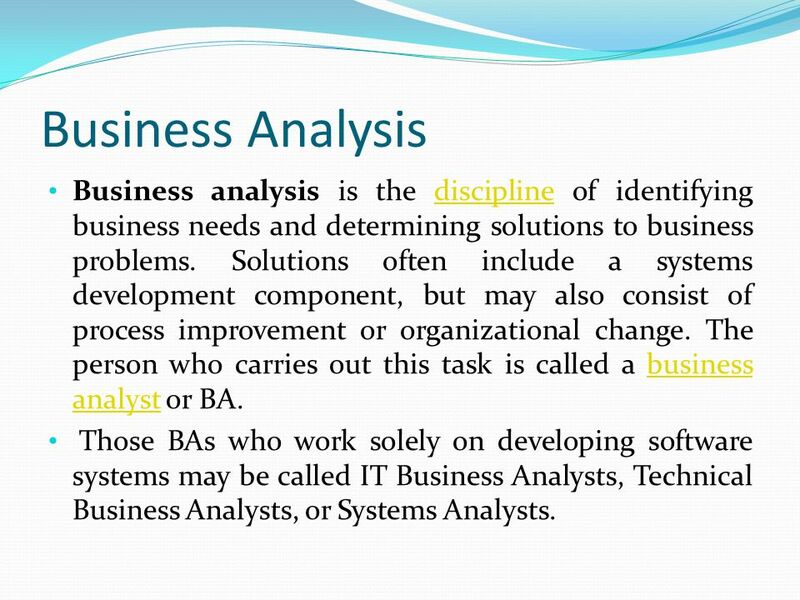 2 Business Analysis Business analysis is the discipline of identifying business needs and determining solutions to business problems. Solutions often include a systems development component, but may also consist of process improvement or organizational change. 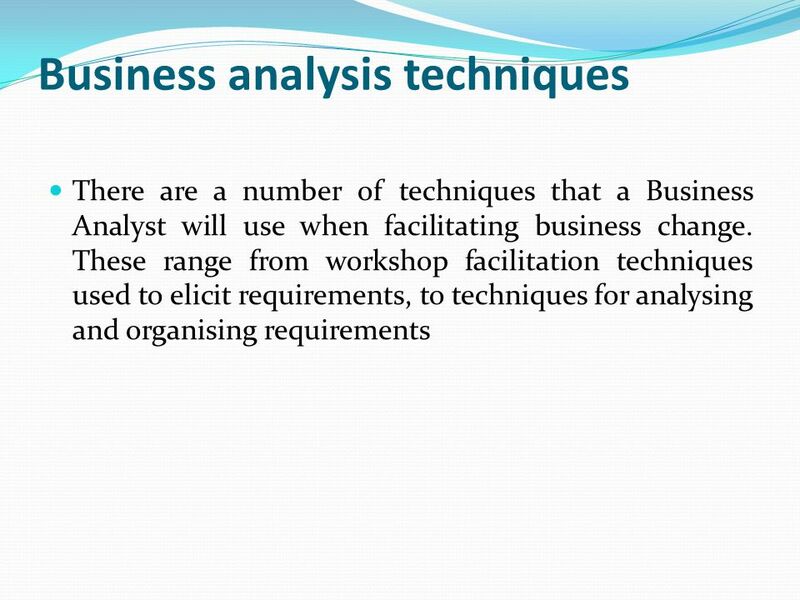 The person who carries out this task is called a business analyst or BA. 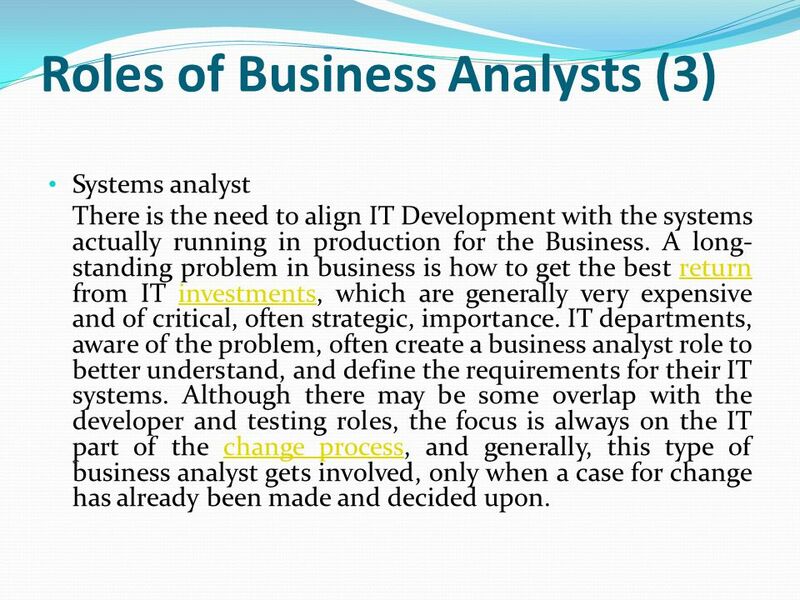 Those BAs who work solely on developing software systems may be called IT Business Analysts, Technical Business Analysts, or Systems Analysts. 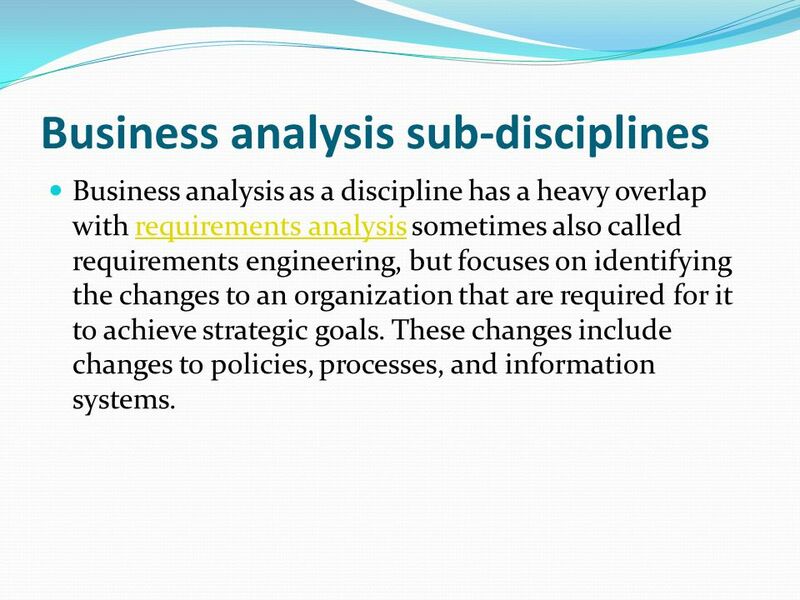 Business analysis as a discipline has a heavy overlap with requirements analysis sometimes also called requirements engineering, but focuses on identifying the changes to an organization that are required for it to achieve strategic goals. These changes include changes to policies, processes, and information systems. 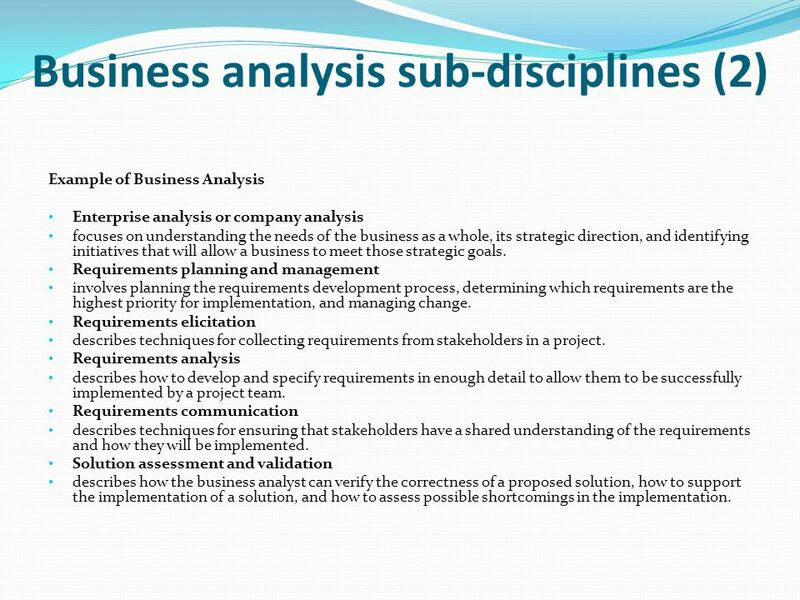 Example of Business Analysis Enterprise analysis or company analysis focuses on understanding the needs of the business as a whole, its strategic direction, and identifying initiatives that will allow a business to meet those strategic goals. Requirements planning and management involves planning the requirements development process, determining which requirements are the highest priority for implementation, and managing change. Requirements elicitation describes techniques for collecting requirements from stakeholders in a project. Requirements analysis describes how to develop and specify requirements in enough detail to allow them to be successfully implemented by a project team. 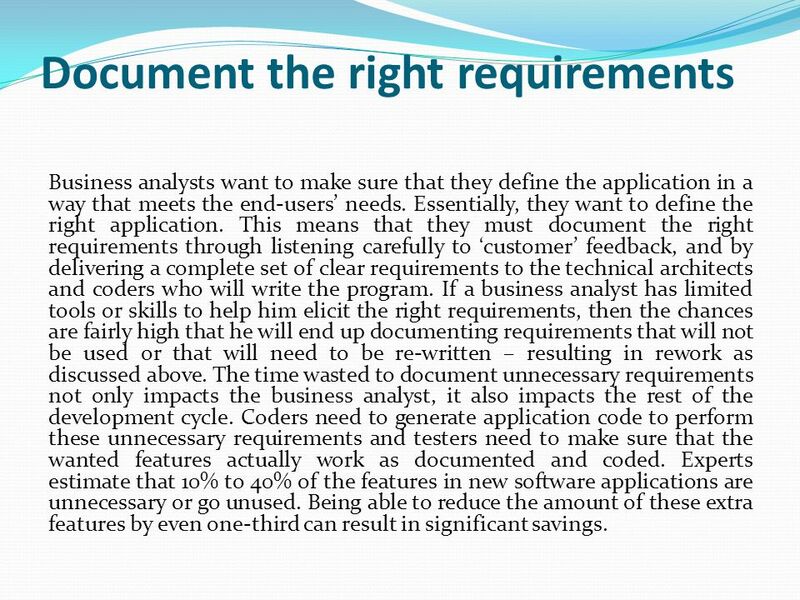 Requirements communication describes techniques for ensuring that stakeholders have a shared understanding of the requirements and how they will be implemented. Solution assessment and validation describes how the business analyst can verify the correctness of a proposed solution, how to support the implementation of a solution, and how to assess possible shortcomings in the implementation. SWOT This is used to help focus activities into areas of strength and where the greatest opportunities lie. This is used to identify the dangers that take the form of weaknesses and both internal and external threats. The four attributes of SWOT: Strengths - What are the advantages? What is currently done well? Weaknesses - What could be improved? What is done badly? Opportunities - What good opportunities face the organisation? Threats - What obstacles does the organisation face? CATWOE This is used to prompt thinking about what the business is trying to achieve. 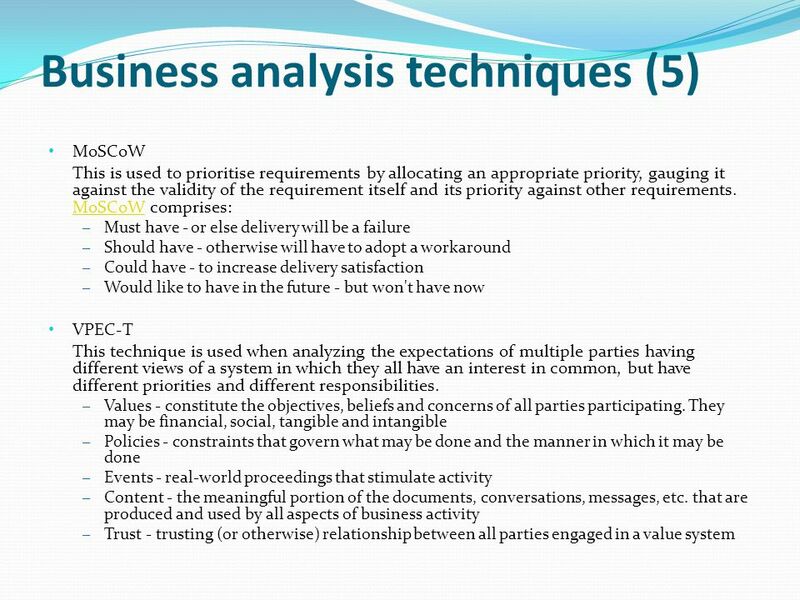 Business Perspectives help the Business Analyst to consider the impact of any proposed solution on the people involved. There are six elements of CATWOE Customers - Who are the beneficiaries of the highest level business process and how does the issue affect them? Actors - Who is involved in the situation, who will be involved in implementing solutions and what will impact their success? Transformation Process - What processes or systems are affected by the issue? World View - What is the big picture and what are the wider impacts of the issue? Owner - Who owns the process or situation being investigated and what role will they play in the solution? Environmental Constraints - What are the constraints and limitations that will impact the solution and its success? De Bono 6Hat This is often used in a brainstorming session to generate and analyse ideas and options. It is useful to encourage specific types of thinking and can be a convenient and symbolic way to request someone to “switch gear. 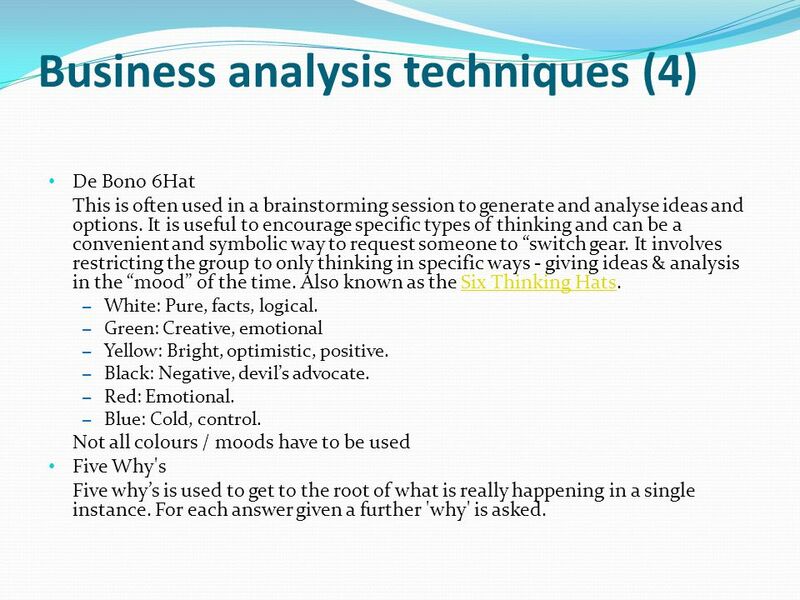 It involves restricting the group to only thinking in specific ways - giving ideas & analysis in the “mood” of the time. Also known as the Six Thinking Hats. White: Pure, facts, logical. Green: Creative, emotional Yellow: Bright, optimistic, positive. Black: Negative, devil’s advocate. Red: Emotional. Blue: Cold, control. Not all colours / moods have to be used Five Why's Five why’s is used to get to the root of what is really happening in a single instance. For each answer given a further 'why' is asked. 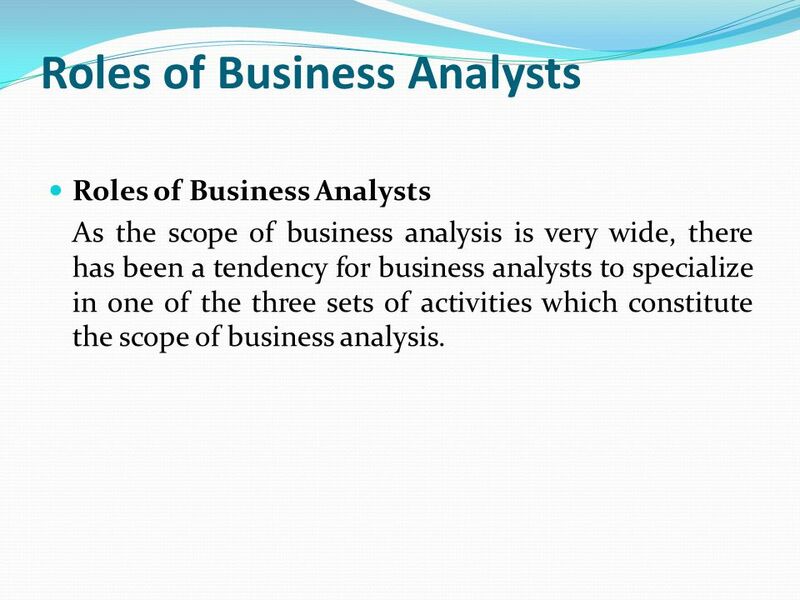 As the scope of business analysis is very wide, there has been a tendency for business analysts to specialize in one of the three sets of activities which constitute the scope of business analysis. Strategist Organizations need to focus on strategic matters on a more or less continuous basis in the modern business world. Business analysts, serving this need, are well-versed in analyzing the strategic profile of the organization and its environment, advising senior management on suitable policies, and the effects of policy decisions. Architect Organizations may need to introduce change to solve business problems which may have been identified by the strategic analysis, referred to above. Business analysts contribute by analyzing objectives, processes and resources, and suggesting ways by which re-design (BPR), or improvements (BPI) could be made. 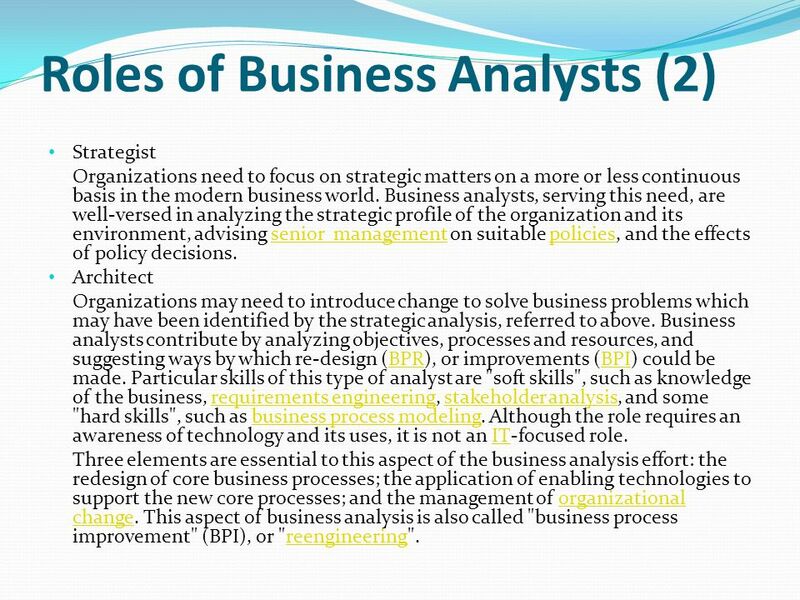 Particular skills of this type of analyst are "soft skills", such as knowledge of the business, requirements engineering, stakeholder analysis, and some "hard skills", such as business process modeling. Although the role requires an awareness of technology and its uses, it is not an IT-focused role. Three elements are essential to this aspect of the business analysis effort: the redesign of core business processes; the application of enabling technologies to support the new core processes; and the management of organizational change. 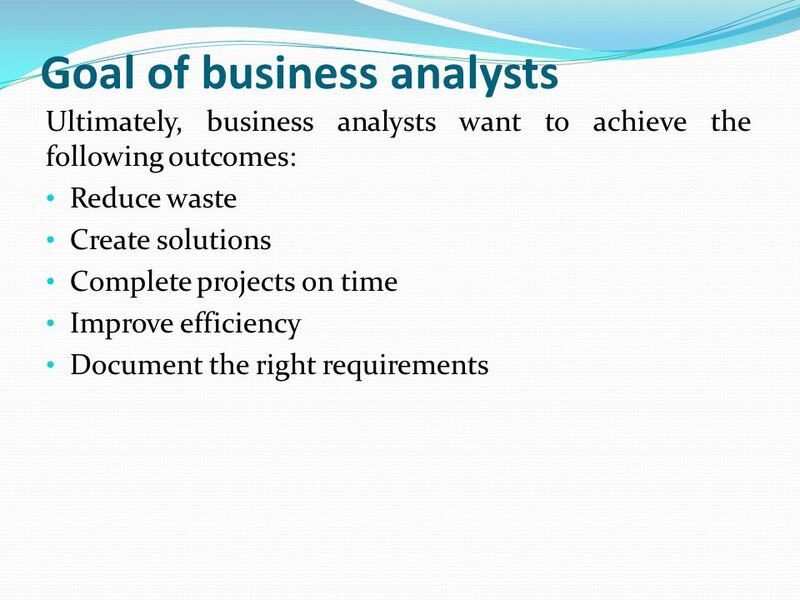 This aspect of business analysis is also called "business process improvement" (BPI), or "reengineering". Systems analyst There is the need to align IT Development with the systems actually running in production for the Business. A long-standing problem in business is how to get the best return from IT investments, which are generally very expensive and of critical, often strategic, importance. IT departments, aware of the problem, often create a business analyst role to better understand, and define the requirements for their IT systems. Although there may be some overlap with the developer and testing roles, the focus is always on the IT part of the change process, and generally, this type of business analyst gets involved, only when a case for change has already been made and decided upon. 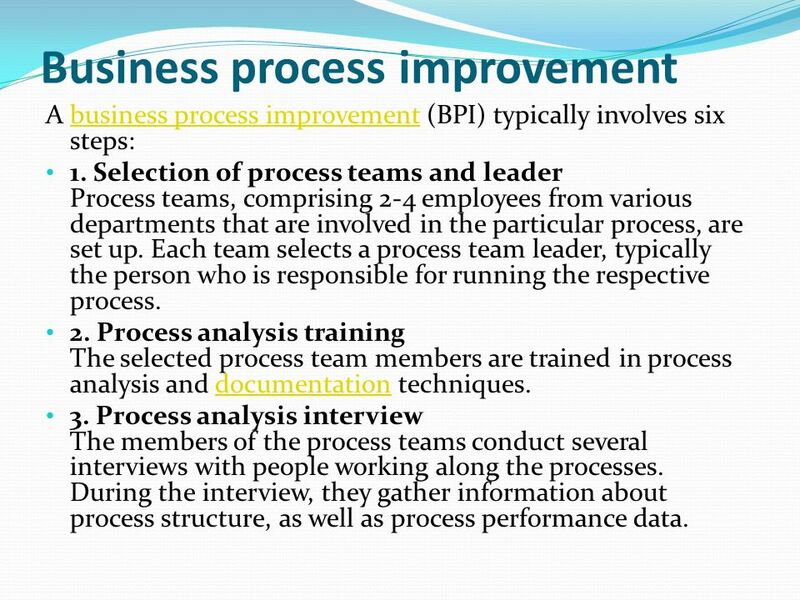 A business process improvement (BPI) typically involves six steps: 1. Selection of process teams and leader Process teams, comprising 2-4 employees from various departments that are involved in the particular process, are set up. Each team selects a process team leader, typically the person who is responsible for running the respective process. 2. Process analysis training The selected process team members are trained in process analysis and documentation techniques. 3. Process analysis interview The members of the process teams conduct several interviews with people working along the processes. During the interview, they gather information about process structure, as well as process performance data. 4. Process documentation The interview results are used to draw a first process map. Previously existing process descriptions are reviewed and integrated, wherever possible. 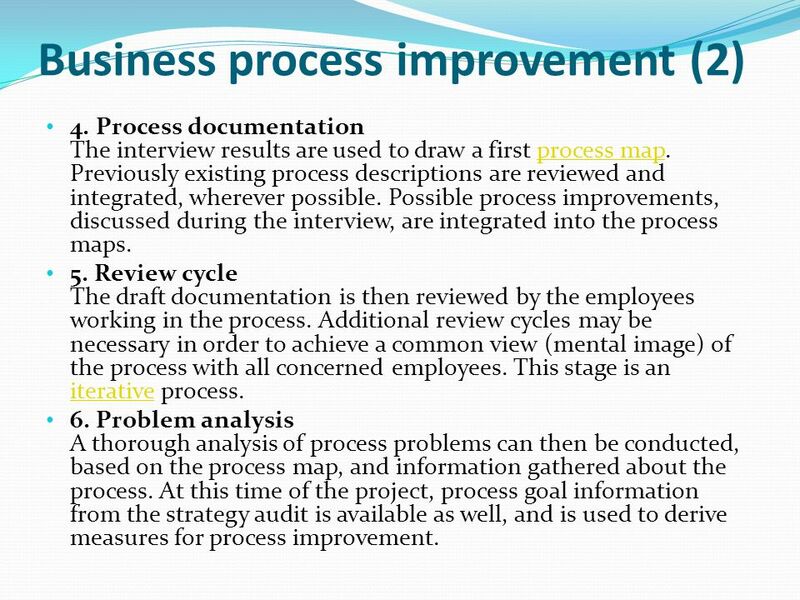 Possible process improvements, discussed during the interview, are integrated into the process maps. 5. Review cycle The draft documentation is then reviewed by the employees working in the process. Additional review cycles may be necessary in order to achieve a common view (mental image) of the process with all concerned employees. This stage is an iterative process. 6. Problem analysis A thorough analysis of process problems can then be conducted, based on the process map, and information gathered about the process. At this time of the project, process goal information from the strategy audit is available as well, and is used to derive measures for process improvement. Project delays are costly in three different dimensions: Project costs – For every month of delay, the project team continues to rack up costs and expenses. When a large part of the development team has been outsourced, the costs will start to add up quickly and are very visible if contracted on a time and materials basis (T&M). Fixed price contracts with external parties limit this risk. 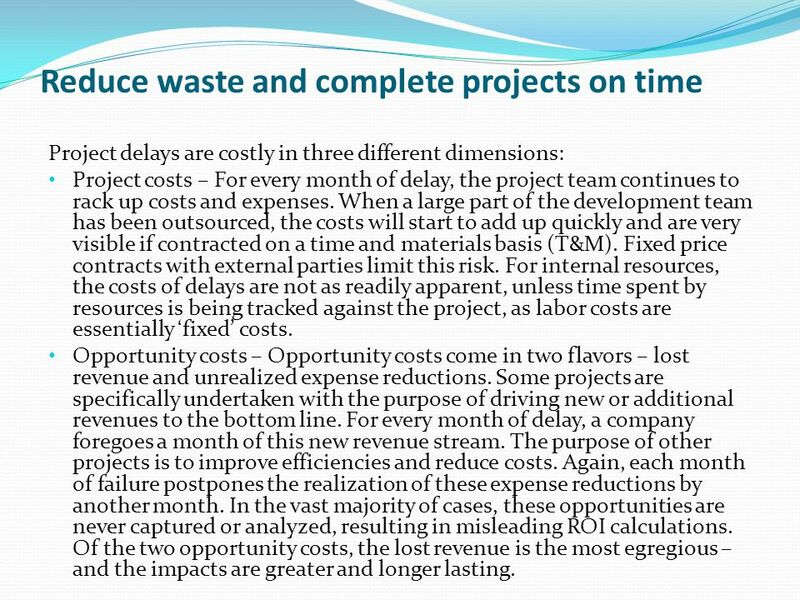 For internal resources, the costs of delays are not as readily apparent, unless time spent by resources is being tracked against the project, as labor costs are essentially ‘fixed’ costs. Opportunity costs – Opportunity costs come in two flavors – lost revenue and unrealized expense reductions. Some projects are specifically undertaken with the purpose of driving new or additional revenues to the bottom line. For every month of delay, a company foregoes a month of this new revenue stream. The purpose of other projects is to improve efficiencies and reduce costs. Again, each month of failure postpones the realization of these expense reductions by another month. In the vast majority of cases, these opportunities are never captured or analyzed, resulting in misleading ROI calculations. Of the two opportunity costs, the lost revenue is the most egregious – and the impacts are greater and longer lasting. Business analysts want to make sure that they define the application in a way that meets the end-users’ needs. Essentially, they want to define the right application. This means that they must document the right requirements through listening carefully to ‘customer’ feedback, and by delivering a complete set of clear requirements to the technical architects and coders who will write the program. If a business analyst has limited tools or skills to help him elicit the right requirements, then the chances are fairly high that he will end up documenting requirements that will not be used or that will need to be re-written – resulting in rework as discussed above. The time wasted to document unnecessary requirements not only impacts the business analyst, it also impacts the rest of the development cycle. Coders need to generate application code to perform these unnecessary requirements and testers need to make sure that the wanted features actually work as documented and coded. Experts estimate that 10% to 40% of the features in new software applications are unnecessary or go unused. Being able to reduce the amount of these extra features by even one-third can result in significant savings. 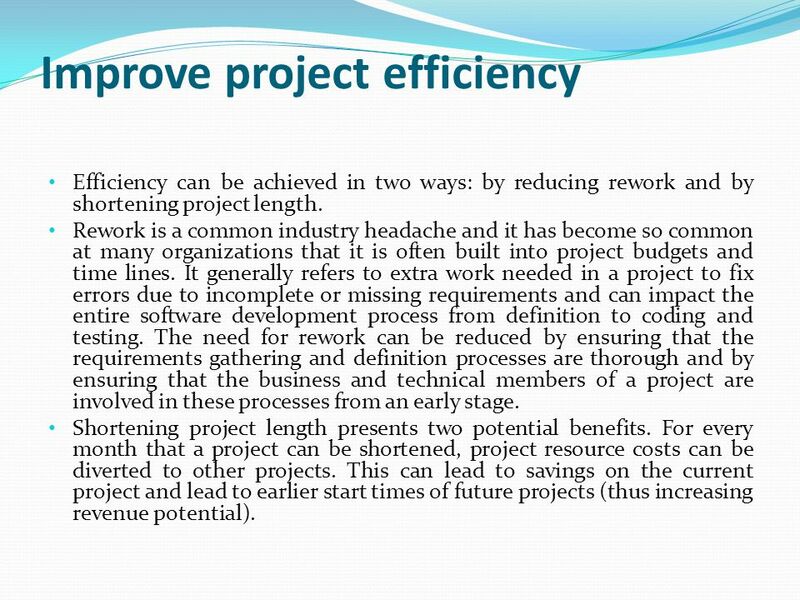 Efficiency can be achieved in two ways: by reducing rework and by shortening project length. Rework is a common industry headache and it has become so common at many organizations that it is often built into project budgets and time lines. It generally refers to extra work needed in a project to fix errors due to incomplete or missing requirements and can impact the entire software development process from definition to coding and testing. The need for rework can be reduced by ensuring that the requirements gathering and definition processes are thorough and by ensuring that the business and technical members of a project are involved in these processes from an early stage. Shortening project length presents two potential benefits. For every month that a project can be shortened, project resource costs can be diverted to other projects. This can lead to savings on the current project and lead to earlier start times of future projects (thus increasing revenue potential). 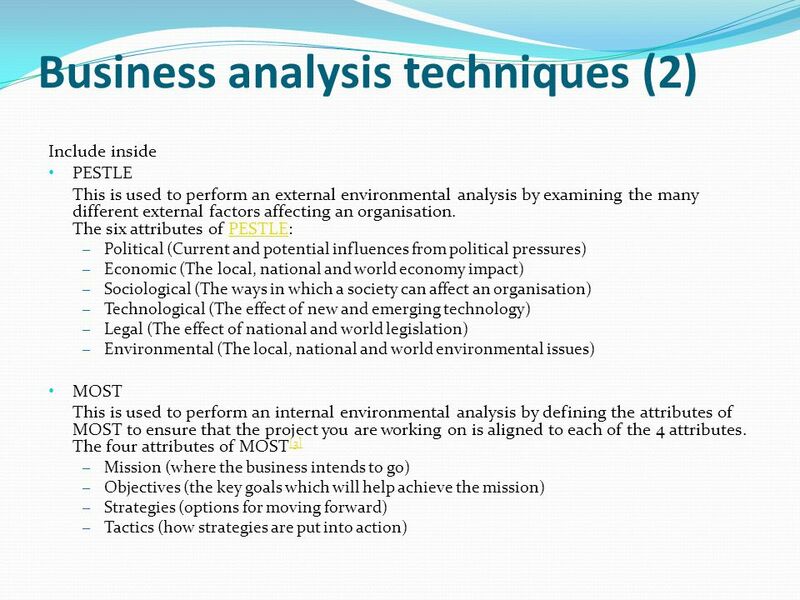 Download ppt "Analisia Proses Bisnis"
Chapter 2 Analyzing the Business Case. Computer Engineering 203 R Smith Requirements Management 6/ Requirements IEEE Standard Glossary A condition or capability needed by a user to solve. Strategic and Operational planning. Planning Planning means the creation of a plan Planning: the organizational process of creating and maintaining a. Chapter 2 DO How can you create a strategic map for your hotel? 9 1 Chapter 9 Database Design Database Systems: Design, Implementation, and Management, Seventh Edition, Rob and Coronel.